A soldering iron is play an important role in professional mobile cell phone repairing service, no matter you are an mobilephone repairing service center or individuals, the Rework Station or soldering iron or soldering station need to choose for phone fixing. First we have to know what's the difference of soldering iron and Rework Station? As we know, the soldering iron is too easy body, only simple plug and soldering Tip, they are usually with different wattage, such as 15 watt, 20 watt, 25 watt, 30 watt, 40 watt, 50 watt etc. For most phone repairing jobs, we can choose 30 watt soldering iron is good enough for our works, most important for for mobile phone repairing, you'd better choose an ESD-Safe soldering iron. The soldering station with all the controls to adjust temperature and a soldering iron, is different with soldering iron, also, we higly suggested to buy an an ESD-Safe soldering station for professional mobile phone repairing job. Maybe you will ask which is the best Smd Rework Station for phone repairing, today we will recommand 1300W Quick TR1300A Hot Air Smd Rework Station. 6. ESD safe design, and with functions of ESD test. 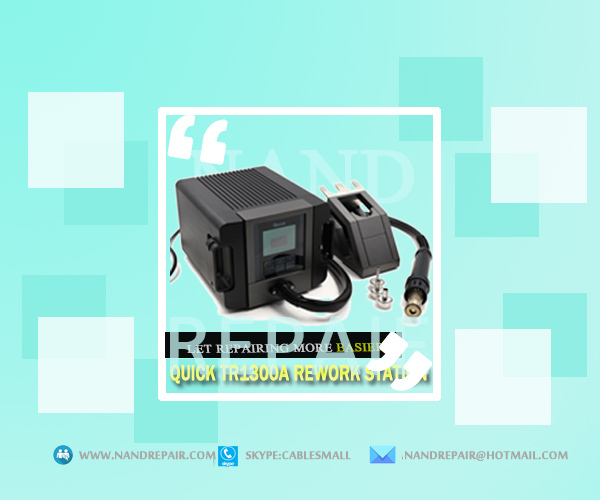 There are many kinds of Rework Station manufacturers and supplier, nandrepair recommand china brand: QUICK, quick soldering station are too top quality and reasonable price, it is populare all of the world.